Back in Spring, the City of Vancouver held a city wide Bird competition. Six popular birds that live in Vancouver all year competed for your vote to be honoured as the official 2015 City Bird. The 6 species of birds that were competing to win votes with the community were: Anna’s Hummingbird, Black-capped Chickadee, Varied Thrush, Pacific Wren, Pileated Woodpecker, and the Northern Flicker. The winner went to the Black-capped Chickadee with a total of 277,924 votes. The cute Black-Capped Chickadee is a can-do bird who loves to explore and is always the first to find a feeder in the area. It’s a social, popular bird who lives in the forest, hides food to eat later, and has a well-known whistled song. 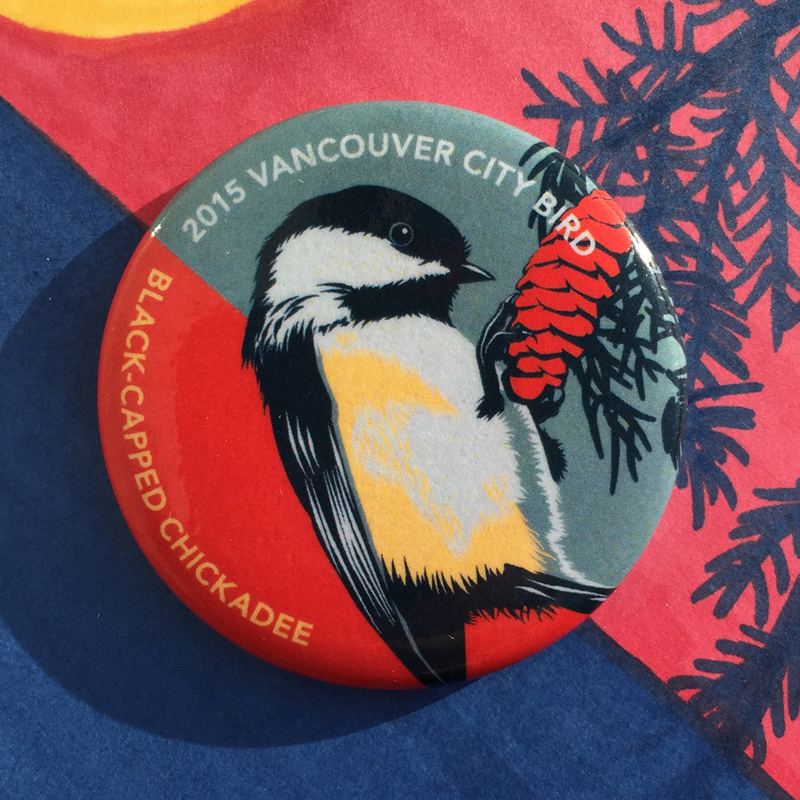 Six Cent Press was thrilled to be part of this competition with 1.5″ buttons being handed out at polling stations throughout Vancouver Parks, and ending with Custom made buttons made to acknowledge & celebrate the winning Black-capped Chickadee.